One of the many gems of Warwick is the seasonal warm summer night outing to the Drive-In to enjoy cinema al fresco. For a second year, the Warwick Summer Arts Festival has partnered with Milkweed Sugar Loaf to present the annual one-night film festival of short films at the legendary Warwick Drive-In Theater. A line up of short films in a variety of genres including drama, comedy, animation, documentary, sci-fi, horror, music and experimental videos. The audience will vote the BEST FILM of the eve. Filmmakers of all ages and experience are invited to present their work and compete to win a cash prize. $200 cash prize to the winner of 'Best Short' of the evening. FILMMAKERS SUBMIT YOUR WORK HERE! Bring your family and friends! The concession stand is open serving your favorite movie-watching snacks. $10 per person;$20 per car. See y'all at the Drive-In this Summer, folks! DUSKLIT is the East Coast's one night interactive art festival. With twilight as a backdrop, DUSKLIT 2018 features 38 immersive installations, performances, and site-specific environments by 64 contemporary artists from Canada and across the United States. Richard Kersting, Wendy Insinger & John F. Simon, Jr.
DUSKLIT is presented on the historic Seligmann Homestead, Sugar Loaf, New York. Once home to the Surrealist Kurt Seligmann, the 55-acre property carries a rich history of art, and magic. The Seligmann Center is located in Sugar Loaf, New York, a historic craft village just 50 miles northwest of Manhattan. Best GPS Address: 23 White Oak Drive, Chester, New York, 10918. Best public transit route from NYC: Take the Coach USA Shortline Bus to the Chester Park & Ride. Then, take a cab for the remaining four miles. This project is made possible with funds from the Decentralization Program, a regrant program of the New York State Council on the Arts with the support of Governor Andrew Cuomo and the New York State Legislature and administered by Arts Mid-Hudson. DUSKLIT 2018 is made possible with funds from the Orange County New York Arts Council's Community Arts Grants program. Local youth artists are celebrated with an exhibit of their work produced through The Front Porch Arts program. Artists ages 8-teen spend five weeks immersed in art making, movement, theater games, storytelling and more under the instruction of Linda Mensch. Up-and-coming artists meet with local artists at their studios to collaborate on an art project, all culminating in a final exhibition of their creative work at Consciousfork Warwick on the evening of August 2 as part of the Warwick Summer Arts Festival. Presented by Front Porch Arts and Linda Mensch. It’s the return of the Sunset Concert at Scheuermann Farms presented by the Warwick Summer Arts Festival! Kick off your shoes and shake it out on the lush lawn of Scheuermann Farms under the stars, nestled up against the cornfields with views of the black dirt vistas. The Scheuermann family once again opens up their farm welcoming friends and neighbors to enjoy an evening of live music, dance performances and great company! The Blue Vipers Of Brooklyn will perform a fun and danceable mix of early jazz, swing, and blues, composed of acoustic guitar/vocals, upright bass, homemade washboard percussion, trumpet and saxophone. Local teen bands, Chemical Catastrophe and Eleventh Hour, will open the evening's performance. The Warwick Dance Collective of the Warwick Center for the Performing Arts will perform in the freedom of the open air space of Scheuermann Farms leading the audience on a visual journey through their contemporary performance. Guests are welcome and encouraged to take to their feet and dance in the energy-filled moment. The Sunset Concert Series at Scheuermann Farms is family friendly and fun for all ages summer event...and an arts festival favorite. Pack your picnic baskets. Bring blankets and chairs. Bask in the fresh country air. The annual Poetry Slam and Jam returns to the Beer Garden at Pennings Farm in Warwick, NY for a fourth year. Rival poets will battle it out with words for the Poetry Slam title by performing poetry to the audience, who act as judges for the event. Contestants go head-to-head reciting poems through multiple rounds as they advance with hopes of being the last poet standing. Live musical entertainment to be announced. The Slam & Jam is open to all ages, so bring the family. Farm to table appetizers and dinner, ice cream and craft beer, hard cider and wine are available to purchase from the Pennings Farm Pub & Grill, the outdoor Beer Garden and the ice cream stand. Contact warwicksummerarts@gmail.com for entry details. Spend the afternoon meandering along the village streets of Warwick, New York appreciating art, witnessing the artistic process of artists as they create new work, experiencing hands-on art making and visiting local shops and restaurants. Wonder Wander Warwick brings art to six public places for all ages to experience. Collaborative groupings of more than a dozen visual and performing artists are located within walking distances at art studios and public spaces throughout the village. 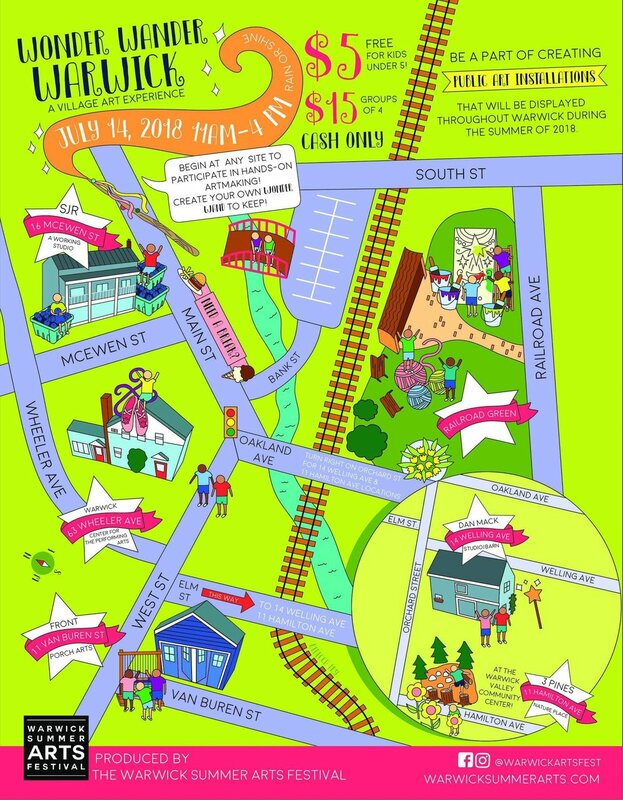 At each of the six locations along the art walk artists will display their work and provide opportunities for guests to participate in hands-on art making, including opportunities to create a Wonder Wand, a keepsake work of art. Select studio stops will have the necessary tools and materials to make mixed media artwork that participants can combine to create their own unique Wonder Wand. >>>work with clay; press leaves, flowers, sticks, stones & other natural materials; and fabricate paper flowers. >>>witness amulets and sculptures carved from stone and bark and ceremonial objects made from stones, sticks and bones. >>>observe drawings and artifacts from the Life and Times of Dr. Thelonious Tinker series. >>>move freely with interpretive dancers and try a hand at Movement Mark Making with paints capturing the dancers movement. >>>participate in creating a large-scale collaborative found-object weaving. >>>paint a miniature portrait or self-portrait on a berry basket to be combined producing a large mosaic portrait mural. >>>create a large-scale interactive painting depicting the festival theme of Transformation through the life-cycle of flowers. >>>up-cycle plastic grocery bags into "yarn" pom-poms and braided roping. Several of the collaborative art pieces will become public art to be displayed in venues during the Warwick Summer Arts Festival and in Warwick storefronts throughout the summer. We are excited to announce that the Orange County Arts Council will once again be hosting the 10 Minute Play Festival, this time as part of the Warwick Summer Arts Festival on July 12th. Save the date! More details about the festival will be coming in the next few months, but we wanted to give our playwrights a chance to get writing. This event is open to all Orange County playwrights, 14 years or older, who live or work in Orange County. Orange County Arts Council is seeking original 10-minute theatrical plays, screenplays, or scenes to be presented as script-in-hand readings only as part of a Ten Minute Play Festival. Up to ten plays will be selected and performed from among the submissions. The focus of this event is on the voice of the Orange County playwright.